The Coming of Autumn and the Hiyaoroshi Onslaught! Well, the calendar says we are in Autumn now in Japan but unfortunately the barometer tells a different story. Temperatures are still hitting 30C and over and the air-con is still getting a good workout. But you can’t argue with the calendar apparently and so along with the arrival of Autumn comes the ubiquitous Autumn themed snacks, beer, chocolate, soft drinks, chips and of course sake! Yep, Autumn brings us Aki-Agari and Hiyaoroshi. While it seems for some breweries the two terms are somewhat interchangeable, Aki-Agari basically refers to the Autumn release of sake brewed in the previous season (ending around March/April or so). Some sake is released soon after brewing such as shiboritate (just pressed) and some nama (unpasteurized) but most sake is held on to for a maturation period of around six months. Hiyaoroshi on the other hand specifically refers to sake that is stored for a while to be released in Autumn without undergoing the usual second pasteurization procedure. As you may or not know, sake is usually pasteurized twice; once before storage and then a second time after maturation when the sake is bottled and shipped. In days gone by it would have been inconceivable to release unpasteurized sake any earlier than autumn as the summer heat could (and did) cause sleeping enzymes and bacteria in the sake to become active, throwing off the flavour profile of the sake. So after undertaking only the first pasteurization the sake was kept in cool storage in tanks (wooden in the old days) till release. Autumn was considered to be cool enough to take the chance of releasing the sake minus the second pasteurization without disturbing any sleeping enzymes, giving folks that zippy freshness of a namazake with the balance of a matured sake. Which makes sense except for the fact that these days refrigeration in breweries, restaurants, retailers and even delivery trucks pretty much means there is no reason why namazake can’t be released whenever a brewery likes. Which is what happens. 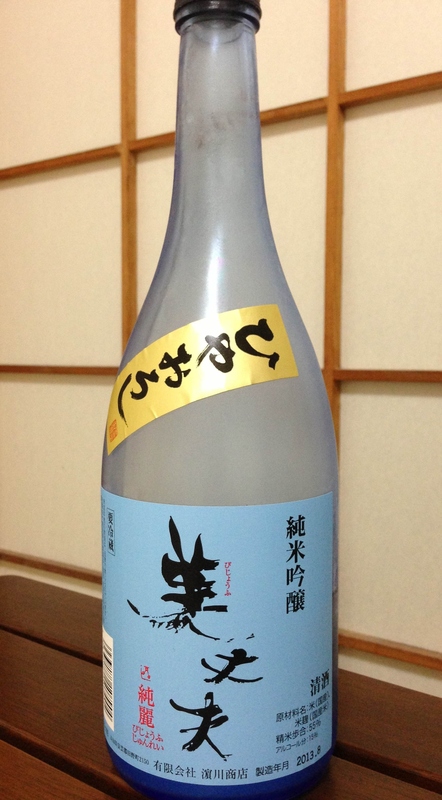 However, I like to think of Hiyaoroshi sake as the more balanced (due to the maturation) style of nama. Incidentally, the word Hiyaoroshi comes from the middle Edo period (1600’s to 1800’s). Hiya- as in chilled (cold storage) and Oroshi-unload/release. These days breweries release some of their sake early, some later some brew all year round leaving Hiyaoroshi as a little irrelevant in some people’s eyes but it’s still the time of year which sees the most new sake hit the streets. And if nothing else, it’s a damn good excuse for a sake festival/tasting/event good ol fashioned knees-up, of which there are plenty around at this time of year. To keep with the theme, I have a personal favourite in Bijoufu’s Hiyaoroshi Junmai Ginjo. From the wonderful sake region of Kochi prefecture, this is a great example of what Hiyaoroshi is all about. The fresh, delicate bouquet of white flowers is amazing. A little steely, tight and. refreshingly dry on the palate with a shiso-like peppery finish. Every bit worth waiting till Hiyaoroshi season for. Posted on September 13, 2013, in sake and tagged aki-agari, bijoufu, hiyaoroshi, Kochi sake、美丈夫. Bookmark the permalink. Leave a comment. See you over at Sake Advocate!